Danger is coming; be advised and take precaution. Last week, when Fed Chairman Jerome Powell assessed the current interest rate level as “just below neutral,” stock market investors breathed a sigh of relief because perhaps Mr. Powell was finally going to appease Donald Trump and go easy on the rate hikes. Stocks lurched higher, bond yields sagged, and the “Powell put” seemed like a done deal. But there’s no such thing as a done deal in the world of central banking – you’d think the markets would know that by now. At least the bond market seems to know it, as they’re justly calling the Fed’s bluff and indicating what’s really going on under the hood with the economy. With an ugly tale of three spreads, the charts don’t lie, and the numbers are unsettling. 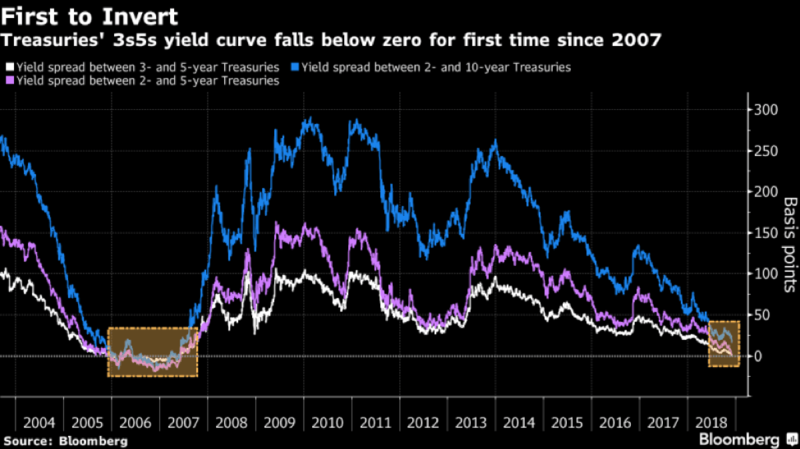 The spread between 3- and 5-year U.S. Treasury yields fell to -1.4 basis points, dropping below zero for the first time since 2007; the 2- to 5-year gap soon also went negative. The 2- to 10-year combo, which is popularly known as “the yield curve,” is more often watched by the mainstream media as a potential recession signal, and this is well on its way into the negative zone, but the other aforementioned convergences are perhaps more ominous. We also witnessed the U.S. 10-year yield slipping below its 200-day moving average for the first time this year. There are a lot of “first time in a long time” records being set in recent weeks, and it’s the worst possible time for these remarkable events to happen. 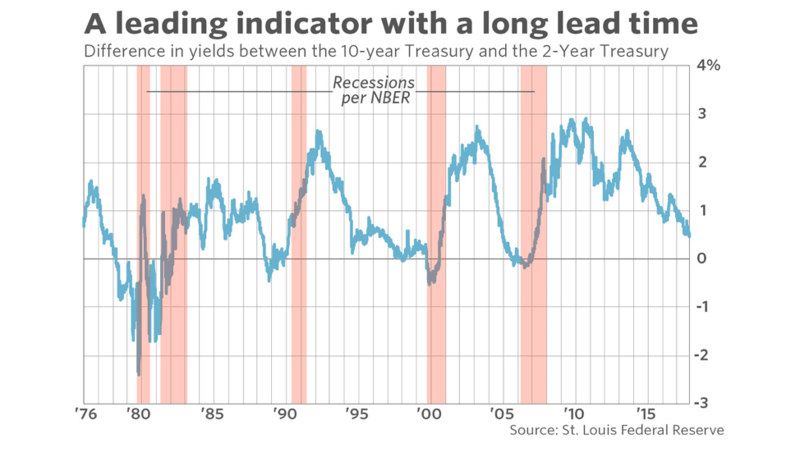 What all of this yield curve flattening and inversion is signaling is investors’ mounting concerns that rising rates against a backdrop of slowing global growth could harm the U.S. economy. As 2019 gets underway, multiple headwinds – widespread pessimism about economic growth, rising inflation, and disappointing global corporate earnings – will make Mr. Powell’s job as economic goalkeeper harder than ever. As I’ve been saying for years now, the Federal Reserve has painted itself into a corner and there’s no way out: each rate hike from now on will threaten to restrict U.S. growth and send the economy and markets into a tailspin. At the time of this writing, the spread between the 2-year and 10-year Treasury note yields is a mere 10 basis points – the most compressed it’s been since just before the Great Recession. Once the inevitable inversion does happen, the countdown will have begun and the Fed will be hard-pressed to maintain their “neutral” outlook. All of the above will be disastrous for the vast majority of retirement accounts and managed investment portfolios. It will be perfectly fine for precious metal holders, however, as well as investors in a properly diversified portfolio of assets. As long as you stay informed – and prepare yourself for what’s coming in 2019 – you’ll not only survive, but will prosper while others are picking up the pieces. Be prudent and stay away from bonds, in my opinion, especially if you’re near the conventional retirement age.